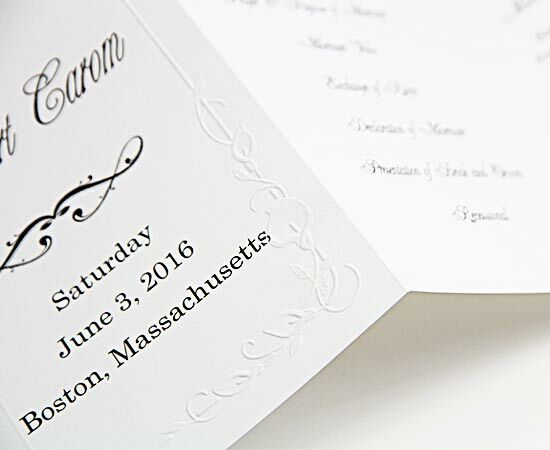 The beautiful calla lily design embossed on the front covers of these programs makes a lovely frame for the names of the bride and groom. Available in Radiant White and Creamy Ecru paper colors. Calla Lily program design is offered in a single fold and trifold format. Both folder and trifold calla lily wedding programs have free printing instructions and Word templates available for download, making it easy to print your own wedding programs right from home. Need extra insert sheets? The appropriate printable insert paper for the Calla Lily programs are Program Insert Paper - 7 3/16 x 10 1/8 size.